NASA's space shuttle Atlantis is set to launch to the space station on Nov. 16 with a cargo of two butterfly species to test how the critters will react to microgravity. Butterflies are slated to get another shot at surviving lifeaboard the International Space Station. Thousands of students plan to joinscientists in watching NASA's space shuttle Atlantis launch to the spacestation on Nov. 16 with a cargo of two butterfly species, apparentlyundiscouraged by last year's experiment where caterpillars in space failed toemerge from their cocoons. 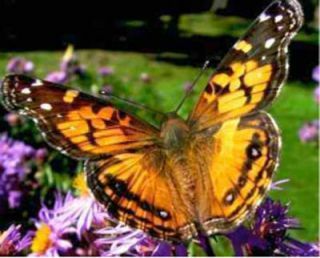 The butterfly habitats hold larvae of both paintedlady butterflies and monarch butterflies, and are scheduledto fly to the space station within a suitcase-sized payload built byBioServe Space Technologies. Scientists at the University of Colorado in Boulder expect to compare the space caterpillars with butterfly larvae raised onEarth by students from 100 U.S. elementary and middle schools. Hundreds ofother schools may join informally by creating their own butterfly habitats. Two orb weaving spiders managed to spintheir webs last year aboard the space station, and so scientists hope tohave betterluck this time in witnessing caterpillars transform into butterflies ?regardless of the seemingly weightless microgravity environment. "We did extensive testing this summer and believe wehave resolved the problem," said Stefanie Countryman, the payload missionmanager for BioServe. "We are adding the monarchs because we had the goodfortune of being able to fly two butterfly habitats." The caterpillars are scheduled for transfer from the spaceshuttle to the space station about two days after launch. They will then takeabout five days to pupate and form a cocoon, and spend another seven to 10 daysbefore hopefully emerging to spread their wings. Automation takes care of most of the space stationexperiment, but astronauts will participate briefly by opening the nectar foodsource around the 10-day mark for any butterfly survivors. Meanwhile, the butterflieson Earth may sup on a different delicious liquid diet. "Gatorade can be diluted with water and used forbutterfly nectar," Countryman told SPACE.com. She added that thespace butterflies would not have the chance to sample Gatorade during theirstay in space. Images taken every 15 minutes will track the butterfliesprogressing through all stages of life, and become available daily on websitessuch as bioedonline.org and the Monarch Watch website. The butterfly experiment represents the latest in a longline of Bioserve payloads flown on the space shuttle, space station, Russia's MIR space station and Soyuz spacecraft. Most of the upcoming payloads slated forthe remaining space shuttle flights represent commercial or life scienceexperiments. But Bioserve also plans to run another classroom experimentnext year, and allow students to connect with the space program beyond beingobservers. "This experiment is slated as an educational payload,"Countryman said. "However, there is solid science that can and hopefullywill result from these experiments."